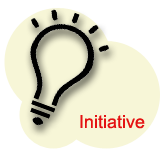 Initiative and "taking the initiative" is a term that you will bump in to every now and then in poker books, on forums and in training videos. But what exactly is initiative in poker, and how can it be used to your advantage? Just to keep you excited, I would say that having the initiative during a hand is just as influential as your actual position at the table. "An introductory act or step; leading action." Initiative in poker is where a player has shown the most aggression in any given betting round. This player is therefore representing the strongest hand at the table and "has the initiative in the hand". As a result, a lot of the play on future betting rounds will be centered around the player with the "initiative". How to take the initiative. To take the initiative, you simply need to make the last aggressive play in the betting round, which involves either betting or raising. Here are a few examples involving players A and B (and sometimes C for good measure) taking the initiative. Examples of taking the initiative. A bets and B calls. - Player A has the initiative. A bets, B raises and A calls. - Player B has the initiative. A checks, B bets, A check-raises and B calls. - Player A has the initiative. A bets, B calls, C raises, A calls and B calls. - Player C has the initiative. A check and B checks. - Neither player has the initiative. It's all pretty straightforward. But basically, if you are calling or checking to close the action, you are not taking the initiative in the hand. This should have helped illustrate what I mean when I say the player that shows the "most aggression" takes the initiative in the hand. When can you take the initiative? The most common place that the initiative is taken is before the flop, as there is almost always a raiser followed by caller(s) before the flop is dealt. However, there is no reason why the initiative can't be taken on future betting rounds such as the flop, turn or river. If there are just calls and no raises before the flop, then no player has the initiative. The player that shows the most aggression on the flop will then be taking the initiative. In addition, the initiative can change from one player to another on different betting rounds. The initiative does not stay with one player throughout the hand, as it can easily switch to play that shows the most aggression on future betting rounds. Example of the initiative changing hands. Preflop: A raises and B calls. Player A has the initiative. Flop: A bets, B raises and A calls. Player B has the initiative. Taking the initiative puts you in the drivers seat in the hand. Other players will wait for you to make the first move by checking to you. By betting and raising your hand has unlimited strength in the eyes of your opponents. By taking the initiative, you are making it far more difficult for your opponent to assign you to a specific range of hands. Being aggressive forces other players to make tough decisions, which means that they have less control over the hand and are more susceptible to making -EV plays. Initiative is the reason why continuation bets are so effective and why relative position is such an important concept to be aware of at the Texas Hold'em tables. It also opens up a whole lot more opportunities to pick up uncontested pots that would normally fall in to another player's stack. Having the initiative is almost as important, if not equal to, your position at the table. Don't underestimate the influence that initiative can have in the hands that you play. How to use initiative in poker. I can't give you a how-to guide to initiative in the sense that; "here is where you should take the initiative" and "here is where you should not take the initiative". This main focus of this article is to highlight how it is generally more profitable to be the aggressor by betting and raising as opposed to checking and calling. There's similar strategy for taking the initiative and aggression in the importance of aggression article. Below is an example hand history that highlights how taking the initiative before the flop allows us to win the hand on the flop. Benefit of taking the initiative example hand history. If we has just called before the flop, we would have not taking the initiative in the hand. We would then likely be checking to our opponent who would then make a standard continuation bet, to which we would have to fold (unless we had a very strong reason not to). Just by 3-betting before the flop with our pocket Jacks, the whole hand has been turned on it's head and our opponent could well find themselves folding a hand like QQ, KK to our cbet on the flop. By taking the initiative in the hand we put the power back in to our hands and take down a pot that could just as easily gone the other way. Evaluation of initiative in poker. Would you believe it, there's something else out there that is about as important as table position, and God knows how much strategy articles love to go on about that. Although you don't often hear much about strategy focused on the term "initiative", it's all part and parcel of the whole "aggressive poker is winning poker" philosophy. By being aggressive and raising more often than calling, you are taking the initiative in the hand and giving yourself that extra advantage for when you hit the flop. That's all there is to it. This does not mean that you should be betting and raising with every hand you play, you still need to exercise common sense. Now you just need to practice with it and see how much of an effect initiative has on the hands you play for yourself.